Today is the first day of the 2012 American Coatings Show. We are extremely excited about this show. 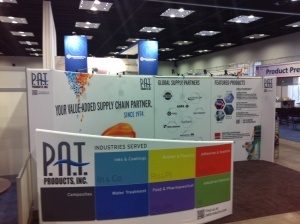 We have a large 10 x 20 space and we are very proud of our booth design. The booth was constructed and set up in the exhibition hall yesterday without any issues. If you’re at ACS come visit us at booth 1453! Our booth at ACS on Monday. Today it will be filled with customers!